Berkeley High School students were greeted by U.S. Rep. Sander Levin, center, and his staff in Washington, D.C.
Detroit teens join marches in Washington, D.C., and Downtown Detroit. Continuing the legacy of Rabbi Abraham Joshua Heschel from the great civil rights marches in the 1960s, Jews from Metro Detroit prayed with their feet here and in the nation’s capital by participating in the historic student-led March for Our Lives on March 24 calling for safer schools, tighter gun control laws and an end to gun violence. 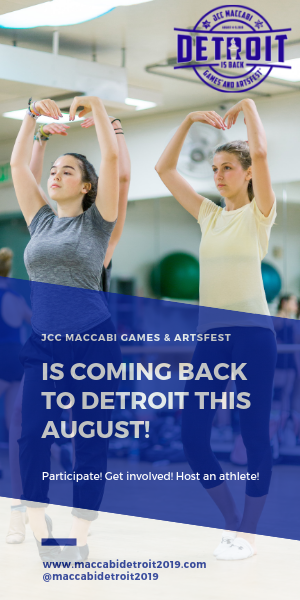 What started out as a proposed trip planned for 10 Temple Israel teens ballooned into one for 50 participants complete with heavily-subsidized overnight flights to Washington, D.C., thanks to generous donations from temple members and the Jewish Federation of Metropolitan Detroit. Rabbi Jen Lader said the idea to take the trip to Washington was initiated by students, completely supported by Temple Israel’s board and clergy, and was a Shabbat experience that spoke to Reform Judaism’s core mission of pursuing social justice. 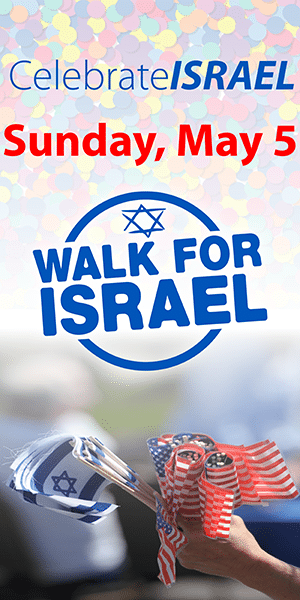 The weekend included a Shabbat evening service at Washington Hebrew Congregation and then an even larger morning service in a hotel ballroom near the march route. Lader said all the weekend’s events, from the religious services led by some 3,000 Reform youth group members to the speakers on the podium, were led and organized by teens. Lader was grateful for the hospitality of Washington-area families who opened their homes and provided the teens with snacks and other amenities for the march. As they processed the day’s events before their flight home, Lader said the march taught the teens they do not have to wait until they are “old enough” to bring about change. “By being part of this important moment, they realized they do not have to put their desire to change things on hold until they are old enough to vote. They have the power to make change now,” she said. Other local Jewish teens who flew to the nation’s capital included eight members of the Jewish Fund Teen Board. As they waited to board a late Saturday night flight back to Detroit, they spoke excitedly about the day’s events and the inspiration they would draw form the day to move them forward in their activism. Jessica Goldberg, 16, exercises her First Amendment rights in Washington, D.C.
Jessica Goldberg, 15, of Farmington Hills and a student at North Farmington High School said the march was just the beginning of her activism for making schools safer, and the issue of tighter gun control laws would “not fall off her radar” as she will be marching again and writing to her school administrators as well as state and federal legislators to bring about change that will save lives. Fellow teen board member Maddie Feinstein, 15, of West Bloomfield and a student at Walled Lake Northern said the most moving parts of the day were the many moments of silence when Parkland shooting survivor Emma Gonzalez took to the podium. Nia Kepes, 16, of Bloomfield Hills and a student at Groves High School in Beverly Hills said participating in the march taught her that she has a voice and left her hopeful that her generation can truly make a change. Read about local walkouts on March 14. Maya Gamer, 15, of Huntington Woods and a student at Frankel Jewish Academy flew to Washington and was the only member of the local chapter of United Synagogue Youth to march under the international USY banner at the march with more than 100 others. Gamer, who is Shabbat-observant, said she and other USYers walked for miles to and from the host synagogue to be at the march while other teens used pre-paid Metro cards for transportation. Temple Israel teens, Washington D.C. 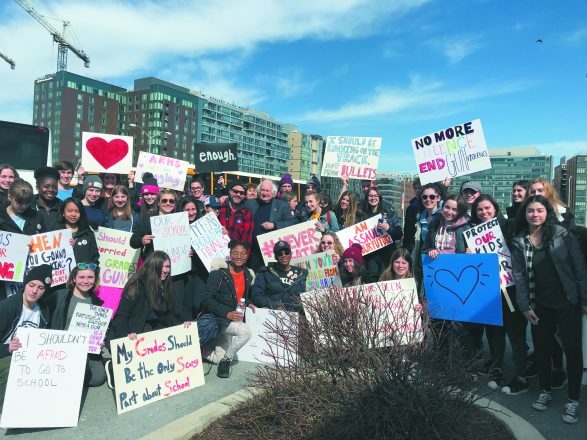 Buses of students from schools like Bloomfield Hills High School and Berkeley High School traveled through the night Friday to arrive at the march early Saturday morning. U.S. Rep. Sander Levin, D-Mich., greeted the Berkeley students with his staff when they arrived and took them to his office for snacks, drinks and restrooms. After, they marched and headed for the main stage where they listened to speeches from people impacted by gun violence. Lacey and her mother, Ellyn Davidson, in Washington, D.C.
“They were all incredible. The speeches were very moving and all shared powerful messages,” said Ellyn Davidson of Huntington Woods, who attended with her daughter Lacey, a Berkley High School senior. “It’s really hard to put into words all of the emotions. I loved watching my daughter and her friends experience this event. It was beautiful, powerful, emotional, inspirational and more. Read reactions from one of the latest school shootings. 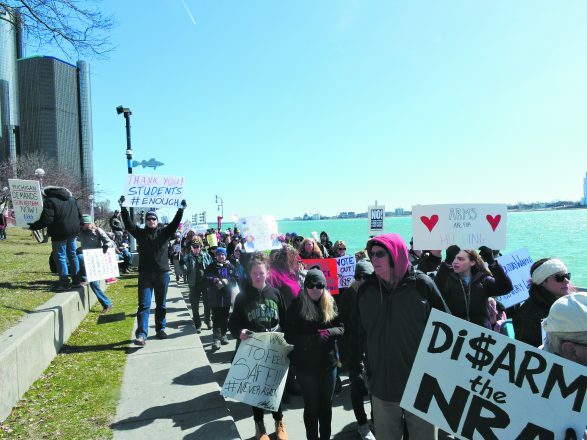 Locally, thousands of marchers walked along the Detroit Riverfront carrying signs condemning the National Rifle Association and bearing the names of gunshot victims. Local members of Moms Demand Action, a gun-control advocacy group, lined the march route wearing yellow vests and handing out voters’ pledge cards collecting addresses and names for people to vote in November’s elections with the well-being of student safety in mind. Marching along the Detroit River. 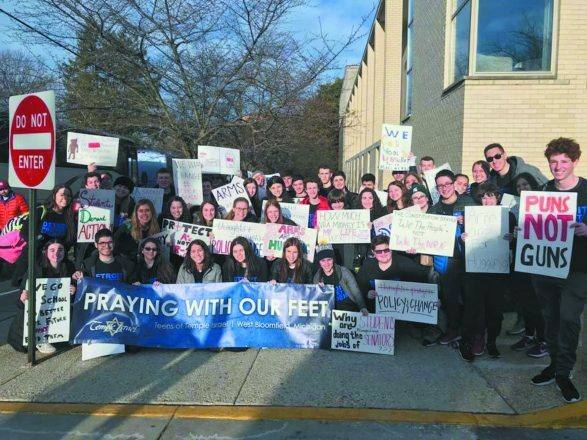 Members of congregations from Shaarey Zedek to Shir Shalom and others repeatedly expressed the importance of making a showing for this cause and referenced Rabbi Heschel’s example of praying with one’s feet. 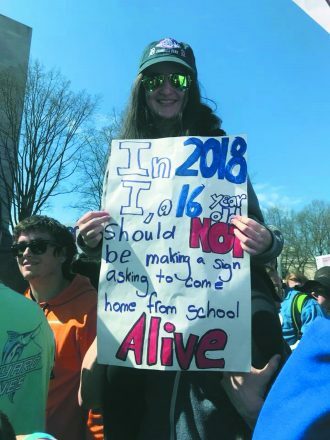 Marching with a sign that read “18th Century Laws Cannot Regulate 21st Century Weapons,” Lindsey Cooper, 15, of Canton and a student at Plymouth-Canton Educational Park joined Shir Shalom teens in the protest. Pediatricians Udi Kapen and Robert Bloom marched together out of concern for their patients. A small contingent of congregants from the Isaac Agree Downtown Synagogue held morning services followed by a discussion on Pikuach Nefesh, the Jewish value of preserving the sanctity of life, before walking several blocks to join the march. 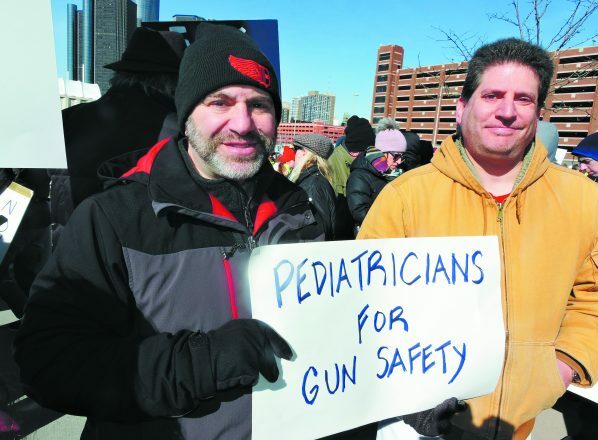 Pediatrician partners Robert Bloom of Beverly Hills and Udi Kapen of West Bloomfield marched locally because gun violence is a public healthcare issue. Standing next to Robinson was Detroiter and Stoneman Douglas High School alumna and Congregation T’chiyah member Dana Kornberg, 35, who was horrified on Feb. 14 to hear that her alma mater had been the place of the latest mass shooting. “The massacre really hit home to me, and it is surreal for me to hear the name of my high school uttered from a speaker’s podium at a rally in Detroit,” Kornberg said. “It was also especially traumatic to hear that some students who were killed at the time of their murders were sitting in a Holocaust studies class. 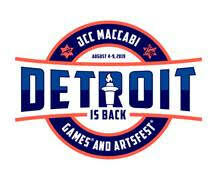 JN Contributing Writer Robin Schwartz contributed to this report. 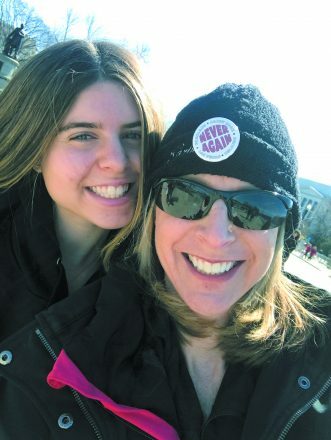 Read more about the March For Our Lives from Rabbi Jen Lader.